Those first baby photos are the most precious and special, and this personalized photo frame is perfect for that very first snapshot! 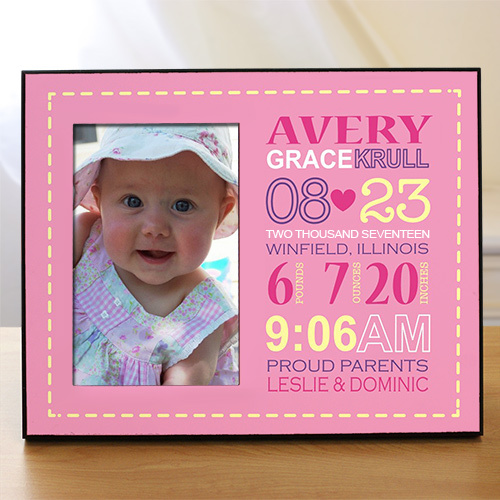 The added touch of birth information ensures that this photo frame becomes a keepsake any new parent would want to hold on to. Add personalization at no charge to make this newborn baby frame truly one of a kind. One-of-a-kind frames make for heartfelt personalized newborn baby gifts! This was a hit at Christmas. Not only do you get to display a wonderful picture of your child/grandchild but all the information on the frame will remind you of details on that special day. The Birth Announcement Frame was much better than the picture on the website! The new parents were thrilled with it.